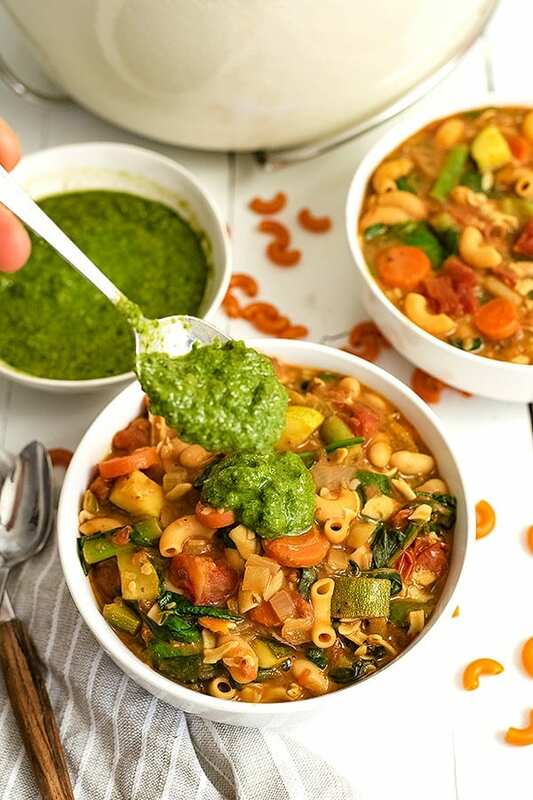 Vegan Minestrone Soup is the perfect lunch or dinner recipe! 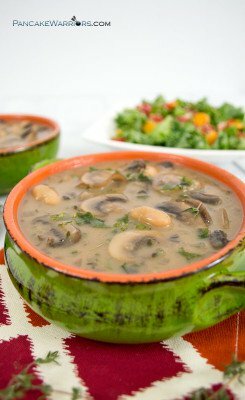 This one pot meal is ready in under 30 minutes and is so easy to make! Packed with vegetables and protein, this recipe will fill you up for hours! 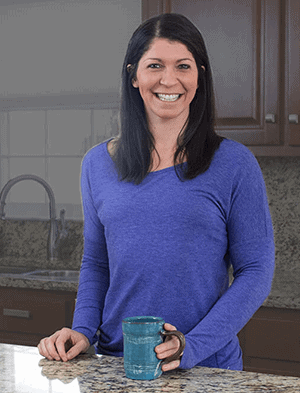 Be sure to check out the Instant Pot and Crockpot instructions too! 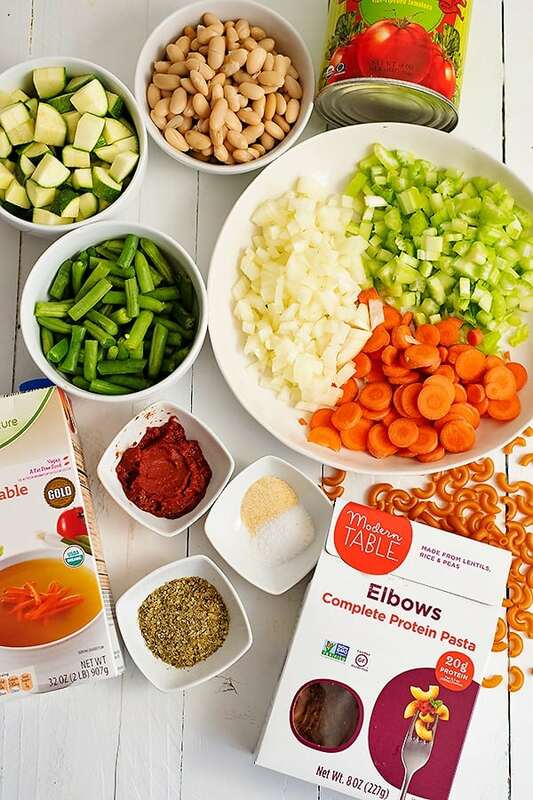 Hands down one of my favorite ways to warm up in the winter time is with a big bowl of soup! 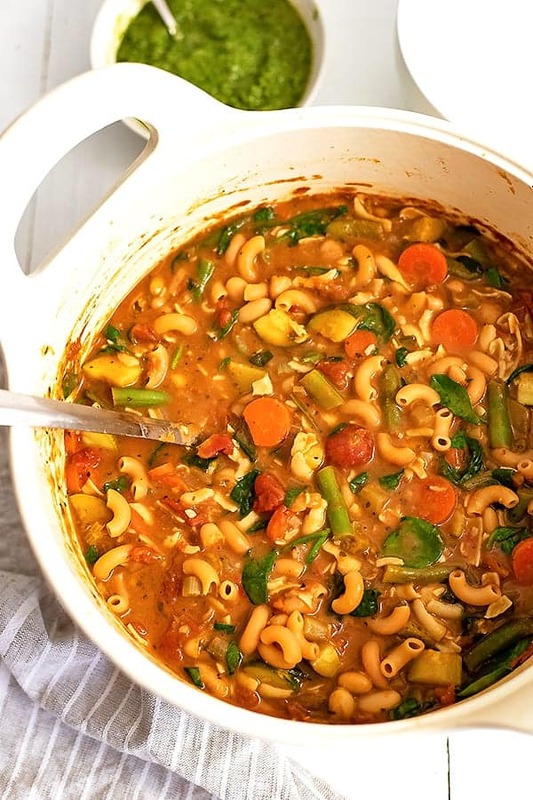 And this vegan minestrone soup might just be my favorite recipe this year! Cooking the pasta in the soup gives the soup a thick almost creamy consistency and it’s so incredibly filling! 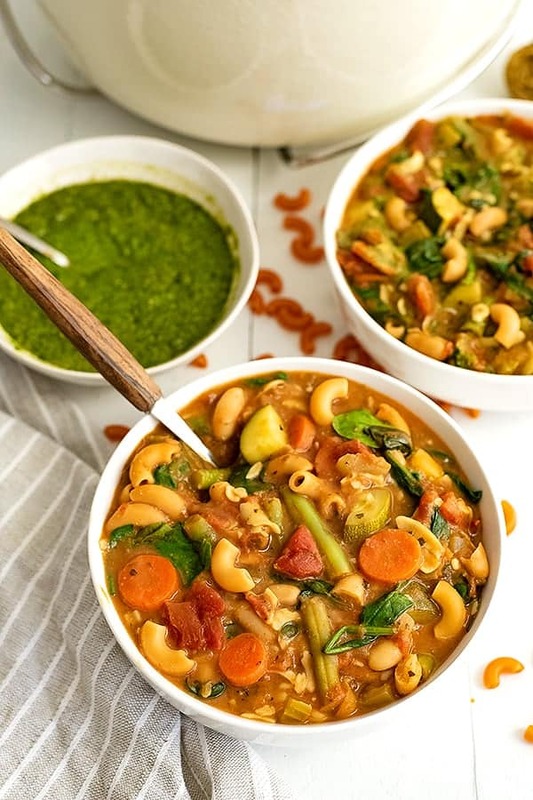 This vegan minestrone soup is the perfect soup to clean out veggies hanging out in the fridge at the end of the week. Minestrone soup was invented as a way to use up whatever vegetables were on hand. Just combine the veggies with beans and pasta for a simple but filling dish! 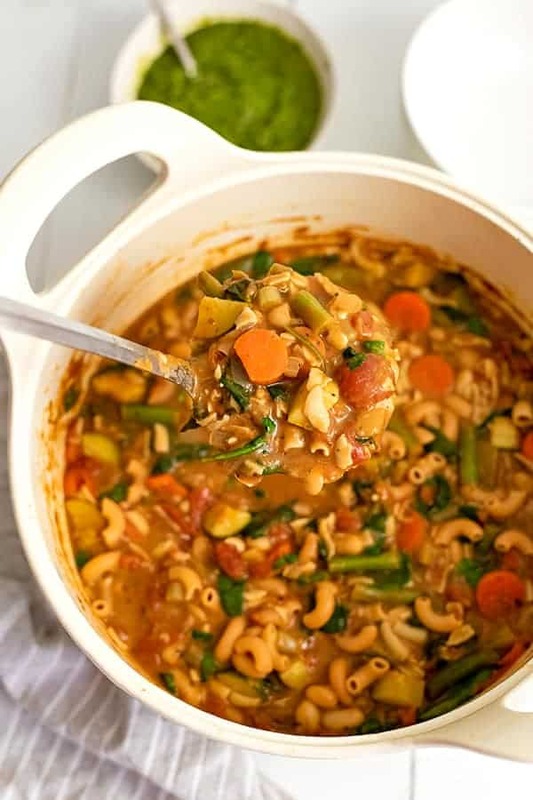 What pasta is best to use in Vegan Minestrone Soup? For this recipe I decided to use Modern Table Protein Pasta Elbows. If you haven’t tried Modern Table pasta, its pasta made with only three plant-based ingredients, the plain pastas are vegan, non-GMO, and gluten-free. All Modern Table pastas are lentil-based and contain complete proteins – meaning they have the 9 essential amino acids our bodies need for strong energy, good digestion, and muscle health. 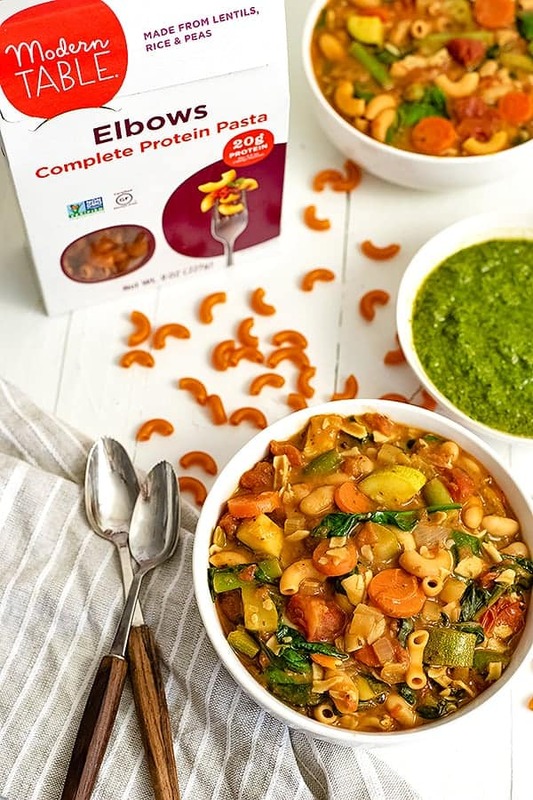 The added protein and fiber from the lentils and pea protein make this vegan minestrone soup more filling and the perfect lunch or dinner idea! Modern Table pastas are for those looking for a healthy lifestyle, and a perfect way to get more nutrition from your meals — a blend of nutrition, with the texture of tradition. Gluten free pasta can sometimes break up if over-cooked! 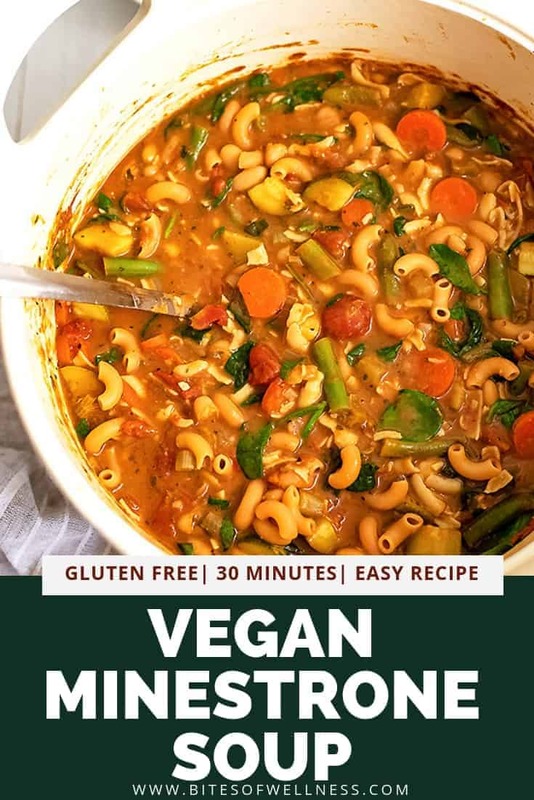 To ensure that you get great texture in this vegan minestrone soup, cook the Modern Table pasta in boiling soup for 4 minutes. After 4 minutes, take the soup off the heat and stir in the spinach. Let the soup sit for 2 minutes, and the pasta will be perfectly cooked! You can store the leftover vegan minestrone soup in the fridge for 3-4 days. If you decide to freeze the soup, you will want to freeze the soup without the pasta. Instead, cook the pasta in the soup as you are reheating it. Simply bring the soup up to a boil and cook the pasta for 4 minutes in the soup. It will be perfectly done! In a large dutch oven over medium high heat, add olive oil and the chopped mirepoix (onion, celery and carrots). Cook for 4 minutes to soften. After 10 minutes, add the Modern Table pasta and cook for 4 minutes, covered. Turn off the heat and remove the lid. Add the spinach and stir well. Allow 2 minutes for the pasta to finish cooking and the spinach to wilt. Serve hot! Add olive oil and the chopped mirepoix. Stir well and allow to sauté until the Instant Pot beeps from the 7 minute timer. Add the rest of the ingredients (except the pasta and the spinach) and put the lid on the instant pot. Cook on high pressure for 2 minutes. Manually release immediately. 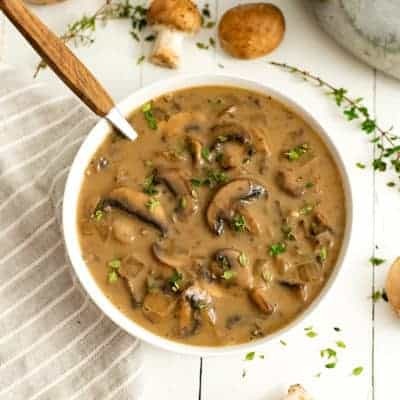 Turn the instant pot back on sauté mode for 5 minutes. Add the pasta and cook for 4 minutes. After 4 minutes, add the spinach and stir well. Serve hot! For added flavor, add a spoonful of pesto! I love this vegan arugula cashew pesto recipe! Add all the ingredients except the pasta and the spinach to the crock pot. Stir well. 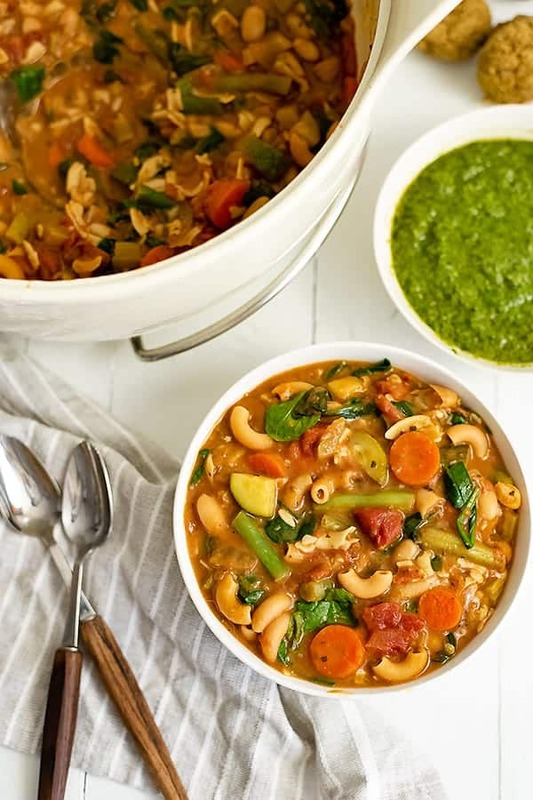 In just 30 minutes this delicious vegan minestrone soup is ready to eat! Watch the video below and see how easy it is and let me know if you have any questions in the comments below. 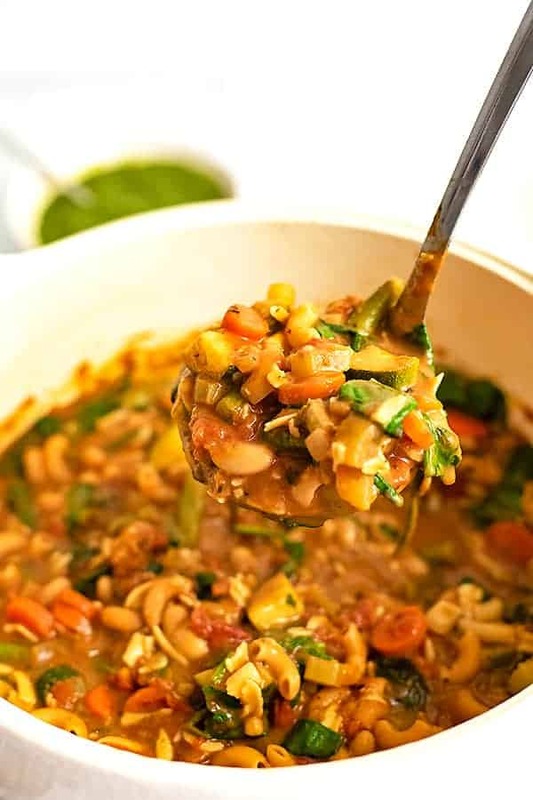 Vegan Minestrone Soup is the perfect easy healthy recipe! It's great for lunch or dinner and is packed with vegetables and protein! Ready in under 30 minutes on the stove top (with instructions for the instant pot and crockpot too). Great for meal prep or family weeknight meals! Add the rest of the ingredients except the pasta and the spinach and put the lid on the instant pot. Right before serving, turn the crock pot on high and add the Modern Table pasta. Cook for 10-15 minutes until the pasta reaches the right texture.